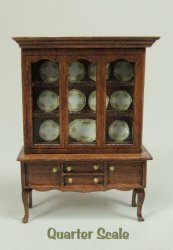 We have spent months developing our new line of quarter scale furniture kits. We are using Bespaq's high standards of quality as our own, We feel that you should be able to create a piece from a kit in quarter scale that has all of the detail, quality and style that you find in ready made Bespaq. Bespaq has rewarded our efforts by granting us exclusive permission to reproduce their 1/12 line in 1/4 scale kits for you. Look for REAL cabriole legs, gorgeous cherry wood, delicatre hardware, custom designed and printed fabrics and coordinating wallpaper and rugs. You will not find this calibur in quarter scale kits anywhere else. We provide easy to follow instructions and will have an extensive free online tutorial of techniques and tips for working with our kits so that you can achieve the best results possible. 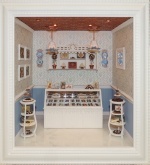 Kits are available by complete room, and individual pieces can also be purchased.